The Nigerian Senate has rejected a report of its committee on finance on the 2016 budget of the Federal Inland Revenue Service (FIRS). The Senate rejected the budget proposal after going through the recommendations made by its Finance Committee. Lawmakers frowned at the increase of 25 billion Naira in personnel cost while the overhead cost of the agency also rose by 13 billion Naira. the Senate also wondered why the figures drastically increased in the space of one year. Another lawmaker, Senator Barau Jubril, expressed concern at the shortfall in the FIRS’ revenue projection for 2015. According to the report by the Finance Committee, the FIRS had a revenue projection of 4.36 trillion Naira for 2015 but generated 3.7 trillion Naira. 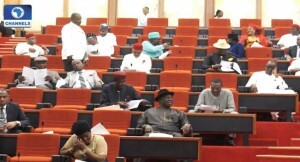 The Senate ordered its Finance Committee to withdraw the document and told the members of the committee to properly tidy up a number of issues raised concerning it and return it in one week.